1. 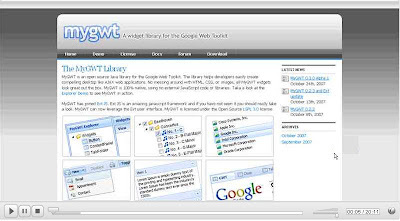 MyGWT- A Profession looking, ready to use Widget library inspired by ExtJs. Special thanks to Darell for this framework. 2. GWT Incubator - A library put by GWT Developers and community itself. They have some advanced widgets like a Grid (ScrollTable), a must see toolkit. 3. GWT DND- A Library dedicated to Drag and Drop support for GWT. A must see one, it has around 13 very good examples of different ways of Drag and Drop. You think of some thing in drag and drop and this library has it. Thanks to Allen for this library. 4. Chronoscope from Timepedia- A up coming Time Machine on top of GWT. Excellent framework when it comes to visualization of Time Series data. Has some of the same things you see on Google finance, but it can be developed using GWT. Not totally complete yet, the first beta is yet to come and so is the IE support for GWT. But never the less, a Library to watch out for.